Wuggle Pets, the adorable baby pets you bring to life. Kids love to build, collect and trade Wuggle Pets! Just add in the fluffy softness, sprinkle in the magic, choose your Wuggle’s personality and put it right inside and watch your Wuggle pet come to life. Everything you need to create your Wuggle pet – even a Birth certificate! 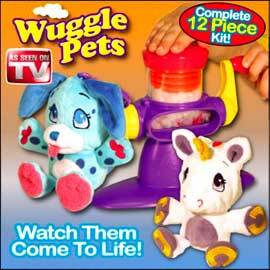 Wuggle Pets, as seen on TV, need lots of attention, so take them with you wherever you go! Kids love Wuggle Pets and they provide hours of fun! Ages 4 and up.